"With improved cooperation, improved economy and shared solutions for fighting world challenges, BRICS will further expand its influence in the next decade," predicted a Chinese expert on Thursday during a seminar in southeastern China. Huang Youyi, a member of the Chinese People's Political Consultative Conference (CPPCC) and executive vice president of the Translators Association of China, foresaw the growing impact of the association of emerging countries on the world stage during an interview with China.org.cn on the sidelines of the BRICS Seminar on Governance that opened Aug. 17 in Quanzhou, Fujian Province. 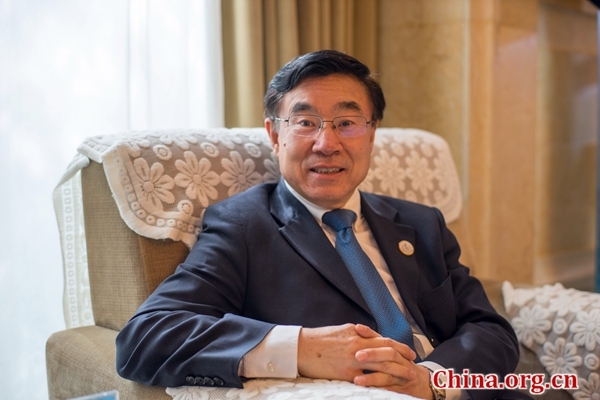 "The actions of the BRICS members have a global impact rather than just being restricted to the five member countries," said Huang, pointing out that more countries were showing interest in the mechanism and would like to learn from each country's successful development models. Earlier this year, Foreign Minister Wang Yi said China would explore the expansion modalities for "BRICS Plus" and build a wider partnership by holding dialogues with other major developing countries and organizations, so as to turn BRICS into the world's most influential platform for South-South cooperation. Currently, the BRICS group has five member countries - Brazil, Russia, India, China and South Africa - and potential new members such as Mexico, Pakistan and Sri Lanka. The seminar in Quanzhou, in Huang's words, "fully reflects the BRICS spirit as well as China's position of common consultation and win-win resolution", with people from different parts of the world, including Africa, Asia and Latin America, coming together to exchange ideas and explore various options for governance suited to their own situation. Explaining China's approach to domestic governance, Huang said that, after many trials and tribulations and more than 100 years of experience, only in the last decades had the nation managed to find a path suitable to its own conditions, namely, the road of socialism with Chinese characteristics, able to carry out reforms and meet various important goals. Besides the domestic approach, China's global governance style has met with strong support, with its ideas like building a community of shared future for mankind, inclusive development and common consultation gaining popularity worldwide. "The idea of 'BRICS Plus' does sound attractive," he added.